The right font can transform a good design into a great design. Free fonts are the usual choice but sometimes the font you opt for is so overused, it can dilute your brand image. Moreover, finding the right type of font is super tedious. 1. Toxa Ink is a simple hand-drawn typeface with one set of alternates for all capitals and a set of a ligature to replace double characters. To access the alternate letters of this font, you will need software with Open Type features or a glyphs panel (Adobe Photoshop CC 2015, Adobe Illustrator, Adobe Indesign). It is an elegant font that can be used to create great designs in Illustrator. 2. Donker Caps is a woodblock type based font. It's an all-caps font with round and sharp shapes. It is perfect if you wish to give your design a clean and quirky twist. 3. Bakersville is a package of 2 hand drawn sketch fonts. The fonts can be used especially for food packaging, menus, etc. and gives your product the authentic hand made look. 4. Blackflower Typeface is a standard hand drawn brush font. It's brutal, rough and messy, with ligatures to avoid twice the same glyph. You can use it for labeling, clothing, books, magazines and album covers. 5. Goldpicker is a vintage retro styled typeface with a western look and feel. It refers to the American wood block type of the previous century. Goldpicker is very useful for covers, posters, labels, t-shirt and logo. Each font comes with a set of alternatives for characters C G Q S V W & and a set for endings for the characters A C E K L M N O R V W X Y Z. You can access the individual characters using the Opentype option or the glyph panel. Goldpicker comes in three layering fonts. The family will be expanded in the future. Buyers will be informed and will get the newly developed font files for free as an upgrade. 6. Picastro is a firm script font with lovely swashes. It is a characteristic font with a retro feel. It contains a full set of ligatures, alternatives, swashes and special characters to end. The OpenType layout features can be used to position or substitute glyphs. 7. Birchwood is a package of 2 hand drawn fonts. The fonts are very useable for restaurant menus, bakery hoardings or websites, etc. 8. SalamacaTF is fun to use typeface. With the OpenType options or the glyphs palette, you make your special typos. The font is based on the wall typography of the city of Salamanca. 9. Moonface Script is a flowing script with lovely swashes. It is based on the 20th Century Packaging typo. Moonface Script is a particular font with a retro feel. It contains a full set of ligatures, alternatives, swashes and special characters to end. Available as an instant digital download after your payment. Desktop font files are supplied in both .otf and .ttf formats and work on both Mac and Windows. You may generate Web fonts formats for use on websites. Note: Some of the OpenType features are only supported by Adobe InDesign, Illustrator, Photoshop CC and Quark XPress, however, even without these programs you may still access all of the characters through your operating system's Character Viewer software which is standard on both Windows and Mac. For more details on this process, click here. The fonts include all of the characters in the standard Latin Western alphabet. The generated Web fonts do not include any OpenType features or the complete set of accented characters that the desktop fonts include. They DO include the basic Western language character set. You may use these fonts for both personal and commercial projects, for yourself or on behalf of your clients. These fonts may be used for printed projects, for use in a logo, or in a website. You may not use it in a product offered for sale where the item contributes to the core value of the product for sale such as in alphabet related products, such as embroidery, stamps, and decals or in film or broadcast without a license upgrade. These fonts may be installed on a single computer only. You cannot sublicense, resell, share, transfer or other redistribute on their own. You may choose multiple quantities in the shopping cart. Ready to grab this set of unique fonts at 90% off? It would be nice if you included a pdf of the design examples shown above for each font bundled in with the package. It would serve as a good summary of what’s included in the purchase, and will also be good inspiration! Thanks. 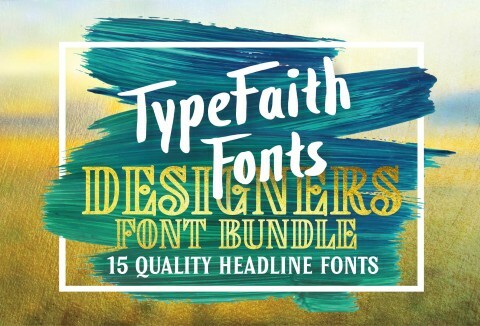 Excellent fonts included in this collection (and the bundle comes with a font samples PDF, along the lines of what others here have spoken about). Recommended!